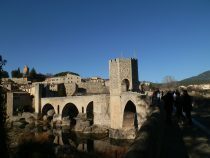 Besalu is a medieval town on the way into the mountains. It consists of a grand stone fortified bridge and a town full of curiosities and small crafts shops. The town sort of tumbles down to the river through the old historic jewish quarter. While around the church and main square it's quite common to have flea markets. Through the narrow streets are oddities like chairs on the walls and from almost every quarter the bridge dominates. 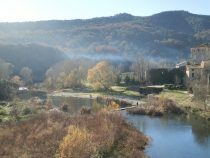 The bridge itself is a rennovation - the original was blown up during the Spanish Civil war - you can still see the old stong in the river below. In the summer you can walk along the river and see hops growing wild. On the way back we called in on Banyoles. 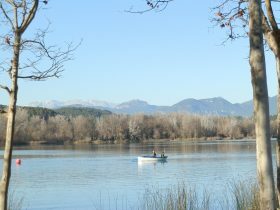 Banyoles is a famous town and fresh water lake just outside Girona. The lake itself can be walked around in a couple of hours and has a many boathouses on jetties stepping out into the water. You can swim in the lake but only in summer - the rest of the year is mainly for rowing.